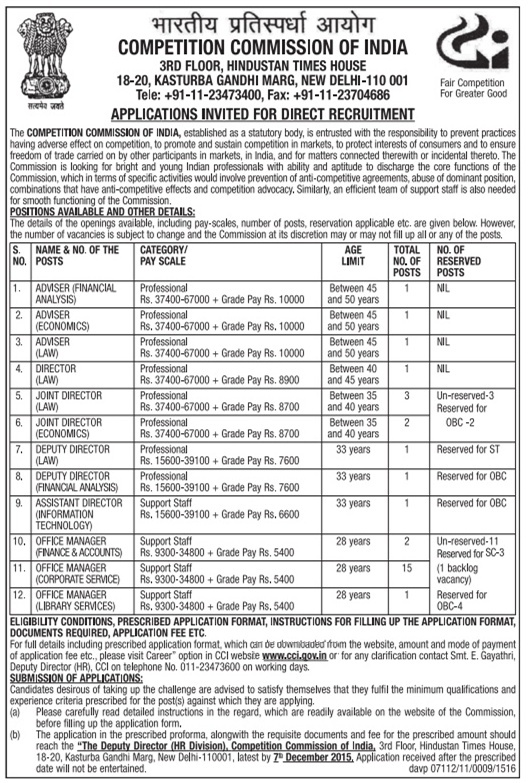 Competition Commission of India (CCI), New Delhi has published a Advertisement for below mentioned Posts 2015. Check below for more details. Ph. D. in Commerce or Finance or Accounting or Chartered Accountant or Company Secretary or Cost and Works Accountant or equivalent and thirteen (13) years experience in the relevant field. (OR) Master's Degree in Commerce or Master's Degree in Business Administration (Finance or Accounts) and seventeen (17) years experience in the relevant field. Ph. D. in Economics or Statistics or equivalent and thirteen (13) years experience in the relevant field (OR) Masters Degree in Economics or Statistics or equivalent; and seventeen (17) years experience in the relevant field. Ph.D. Degree in Competition Law or equivalent and thirteen (13) years experience in the relevant field. (OR) Master's Degree in Law or equivalent and fifteen (15) years experience in the relevant field. (OR) Bachelor of Law or equivalent, and seventeen (17) years experience in the relevant field. Ph.D. in Competition Law or equivalent from a recognized University; and eight (8) years experience in the relevant field. (OR) Master's Degree in Law or equivalent from a recognized University and ten (10) years experience in the relevant filed. (OR) Bachelor of Law (Professional) or equivalent from a recognized University and twelve (12) years experience in the relevant field. Ph.D. in Competition Law or equivalent from a recognized University; and three (3) years experience in the relevant field. (OR) Master's Degree in Law or equivalent from a recognized University and four (4) years experience in the relevant filed. (OR) Bachelor of Law (Professional) or equivalent from a recognized University and six (6) years experience in the relevant field, including in corporate sector. Ph.D. Degree in Economics or Statistics or equivalent from a recognized university; and three(3) years experiences in the relevant filed. (OR) Master's Degree in Economics or Statistics or equivalent from a recognized university; and six (6) years experiences in the relevant filed, including in Corporate Sector. Master's Degree in Commerce or Master's Degree in Business Administration with Accounting and Finance or equivalent (OR) Qualified Chartered Accountant/Company Secretary/ Cost and Works Accountant/ Financial Analyst or equivalent and with three (3) years experience in the relevant field including in corporate sector. Bachelor of Law (Professional) or equivalent. (AND) with three (3) years experience in the relevant field, including in corporate sector. Bachelor's Degree in Technology/ Bachelor's Degree in Engineering or equivalent (OR) Master's Degree in Computer Application/ Master's Degree in Science (Information Technology/ Computer Science/ Engineering). Three (3) years experience in the relevant field. Bachelor's Degree in Commerce or equivalent with three (3) year experience (OR) Bachelor's Degree or equivalent in any discipline from a recognized university with one (1) year diploma in Accounting/ Finance / Cash and Accounts Course of Institute of Secretariat Training and Management or equivalent; and with three (3) years experience in the relevant field. Bachelor's Degree or equivalent in any discipline from recognized university; (AND) Diploma/Certificate course in Human Resource Management/ Secretarial Practices, or equivalent; and with three (3) year's experience in the relevant field. Bachelor's degree in Library Science or equivalent. Three (3) years post qualification experience in the field of library and information services.